THE NEW FLY RODS for 2009 include a trend toward shorter, stouter construction for warmwater and light saltwater applications. The G.Loomis Shorestalker series is a good example. With Hardy and Grey’s marketing directly to the U.S. now (they ended their Cortland relationship this year), don’t be surprised to see more competition in the higher end market and even the mid-range, since they’re bringing the full range of SKUs from overseas. This year Sage replaces the premium TCR line with the lighter and slightly more expensive TCX line of rods. But for the most part rod makers seem content to improve on existing designs and if anything are moving backwards a bit towards “slower” actions. The first example is Orvis‘s decision to begin building 11- and 12-weight rods in their ZG Helios line. We cast these super-light rods at the show and were impressed by their ability to hold lots of line in the air and still have plenty of tip control. The 12-weight Helios weighs only 5 1/4 ounces, making it lighter than many 9-weight rods on the market, and the 11 weighs only 4 3/8 ounces. Both of these rods become available in November 2008 and will retail for $795. Orvis is also extending their freshwater line, building six new “Tip Flex” models in weights 3-6 and three new “Mid Flex” models, including a new 3-weight that weighs 1 3/4 ounces. Finally, Orvis introduces a brand new Helios Lightweight Series for 2009 — the Ion — aimed at those who appreciate small-stream trout fishing with ultra-light rods. While all of the rods in this series weigh 1 3/4 ounces or less, the 2-weight weighs an incredible 7/8 of an ounce. All the new freshwater Helios rods will cost $775, except for the new Superfine Trout Bum One-Weight, which costs $575. G.Loomis got several testers I know excited about their new Shorestalker series at the FFR show. The Shorestalkers are a line of shorter rods made for warmwater and light saltwater use and are designed to cast popper and streamers 20 to 45 feet. The series includes the 8′ FR965-4, and the 8’6″ FR1026-4, FR1047-4, FR1048-4 and FR1049-4 (4-piece 5-, 6-, 7-, 8-, and 9-weights). The rods’ MSRPs range from $320 to $350. When you’d like the flexibility of making a traditional single-handed cast or a full-on spey cast, Loomis’s new 11-foot Roaring River switch rods fit the bill. The series includes the FR1325-4GLX 5-weight, the FR1327-4 GLX 7-weight, and FR1328 4- to 8-weights. Loomis is also bringing two new sizes to their CrossCurrent Pro-1 line: the 7-weight FR 1067-1 and a beefy 11-weight FR10611-1. Sage has replaced the fast-action TCR series with a new, lighter TCX series of fly rods ($780-820) that uses weight-reducing G5 technology. (As Sage rod designer Jerry Siem says, “It’s not what you put into a rod, it’s what you take out of it.”) The new are 12-15% lighter than their TCR counterparts and just as importantly are slightly slower. The TCXs are colored a quite attractive “kryptonite” greenish-gray. Sage also hopes to mimic the success of last year’s sub-eight-foot Bass rod with a smaller cousin, the 230G Bluegill — for, you guessed it, panfish ($199). As with the Bass rod, Sage has designed their own new fly line specifically for the lighter version. Finally the updated “Flight” series, in the mid-$200 to low-$300 price range, replaces the previous year’s “FLi” series. 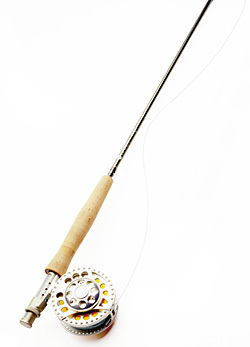 Redington has a new CPX series of fly rods for 2009, ranging in price from $299 (smaller rods) to $399 (spey versions). The new models, designed to be not quite as fast as the old SS series, feature Pac-Bay TCH stripping and hard-chromed snake guides, woven graphite reel seats and nifty machined hidden hook keepers in the saltwater versions. Models in this line include 4-piece 3- thru 6-weights, salt-specific 4-piece 6- thru 12-weights, 4-piece 5- thru 8-weight switch rods, and 4-piece spey rods, along with a couple of 2-piece rod models (thank goodness folks are still making 2-piece rods). Redington also has a new shorter “Predator” series of 4-piece fly rods in line weights 6, 8, 9 and 10. The 6- and 8-weight are 7′ 10″, and the 9- and 10-weight are 8′ 3″ — ideal for turning over big flies in tight conditions. All Predator models are $199. R. L. Winston is adding six rods to their Boron II-MX series and a 12′ 6″ two-handed rod to their Boron IIx line for 2009. The new Boron II-MX rods include a 9′ 4-weight and 9′ 6″ 5-, 6-, and 7-weights ($675-685), as well as an 11′ 6″ 6-weight and a 12′ 3″ 7/8-weight two-handed rod. The new Boron IIx two-hander ($835) is a 6/7-weight designed for light-line and summer steelhead fishing. Hardy and Grey’s is bringing out a new Angel 2 series of fly rods that range in price from $949 to $1299 for single-handed rods, and $1699 to $1999 for two-handers. These light-gray (grey, if you like) rods were hands-down some of the prettiest rods at the show and sported all top-end components. But perhaps most importantly Hardy and Grey’s has brought their entire range of products — including their very popular G-Tec series rods ($350-420 for the single-handed and $450-500 for the double) — to the U.S. for the first time this year. It will be very interesting to see if direct involvement in local distribution will get U.S. fly fishers more interesting in European designs. Tim Rajeff’s Echo Fly Rods has six new rod lines for 2009, including the medium-fast Echo Carbon ($169.99, pictured above) and Echo TR two-handed rods ($349.99). The company will also produce the $99.99 Echo Gecko for kids (which has camo-orange grip and bright yellow blank), the faster action $189.99 Echo Ion, the low-priced Echo Solo ($99.99), and 10′ 10″ Echo SR switch rods. Temple Fork Outfitters (TFO) is offering more “multi-task” 11-foot switch rods designed by Mike Kinney and Bob Meiser ($325-350). The new rods are part of their Deer Creek Switch Rod Series. The designers say their increased use of “helical” wraps on the new blanks will greatly increase strength while reducing weight. Besides introducing two new fly rods for kids, Ross Worldwide is expanding their Essence rod series for ’09. The expanded line will now include 12 different rod models in each of the three series — the Essence FS ($119-129), FC ($169-179) and FW ($219-229) — with everything from an 8′ 6″ 3-weight to a 9′ 11-weight. They are also introducing the FlyStik, a workhorse tournament-length (7′ 11″) rod for pounding streamers against the bank or even catching small tarpon. The light-green FlyStik ($169) comes in 6-, 8- and 10-weights. The new 7′ 6″ 4-weight, 4-piece Journey youth rods ($119) have grips designed to fit a child’s hand and come in bright blue and pink colors. Three years ago St. Croix dropped the Imperial brand name from their product list, but in 2009 it will return as an entirely new line of faster fly rods with new tapers and new technology. The new “Gloss Burgundy” Imperial rods — mostly 4-piecers but with a selection of 2-piece models — will retail for only $150-200 and will come in 25 different models, ranging from a 6′ 2-weight to a husky 9′ 10 -weight. Scott Fly Rods expands their top-of-the-line S4 ($695) series for 2009, with the addition of a full line of 10-footers (4- thru 8-weight) and a 9-foot 9-weight for saltwater. There’s also another new series — the A3 ($295-335, $495 for the two-handed model) — which replaces the A2. The A3 is fully redone for this year, with a graphite matte sanded-finish blank, blue thread wraps and a blue carbon-fiber reel seat. The line will be mostly 4-piece with some 2-piece models, and come in a full creek-rod-to-spey-rod lineup. Scott will also offer a new handcrafted cane model, a 7’10” 5-weight ($2650).